Innsbruck is a city in western Austria, and the capital of the federal state of Tyrol. It is located in the Inn valley at the junction with the Wipptal (Sill River) which provides access to the Brennerpass, just about 30 km south of Innsbruck. Located in the broad valley between tall mountains, the Nordkette in the north, Patscherkofel and Serles in the south, it is an internationally renowned winter sports centre. At Grand Hotel Europa in Innsbruck, modern Italian design and pleasant Tyrolean cosiness meet at the interface of cultures between Munich, Milan, Zurich and Vienna. 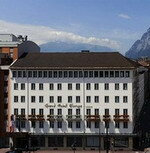 Innsbruck’s only 5-star hotel unites history and future as the first address during the Olympic Winter Games in 1964 and 1976, numerous events and conventions, and in the recent past also as official “headquarters” hotel of the UEFA EURO 2008. 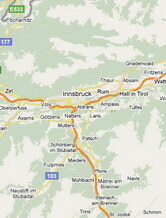 The central city location makes it an ideal starting point for discovering the unique Tyrolean mountain world and culture. The surrounding hiking and ski areas as well as the nearby Stubai Glacier offer the fascinating contrast to the urban flair of the Inn River Valley. The hotel is located in the heart of the city just a few metres from the Maria Theresien Strasse, the main shopping area, and close to the old city, the Golden Roof, Congress Hall and the Royal Gardens. The nearest train station is the Hauptbanhof. The rooms are a good size and decorated in dark wood. All rooms have telephone, colour-cable-television, radio and minibar. All the bathrooms are in a fair condition. The hotel has a restaurant which serves local and international cuisine. The hotel also has a fitness centre, sauna, solarium and a sun terrace. 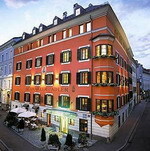 Located in the city of Innsbruck. This hotel combines 15th-century Tyrolean traditions with 21st- century luxury. The hotel offers comfortable guestroom and suites that are traditionally equipped and furnished with numerous amenities. Few suites come with a fabulous Swarovski crystall bathroom, wonderful views and crackling fire burning in the open fireplace. Guests can experience the finest culinary delights- the creative regional and international cuisine that will pamper even the most discerning gourmet. The wine cellar contains exquisite bottles from all the worlds regions. Leisure facilities include a sauna, whirlpool and a massaging centre.